Berea College is distinctive among institutions of higher learning. 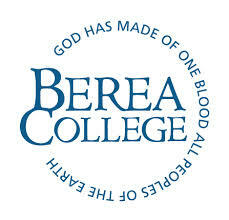 Founded in 1855 as the first interracial and coeducational college in the South, Berea charges no tuition and admits only academically promising students, primarily from Appalachia, who have limited economic resources. Berea's cost of educating a student exceeds $23,000 per year. Berea offers rigorous undergraduate academic programs leading to Bachelor of Arts and Bachelor of Science degrees in 28 fields. All students work at least 10 hours per week in campus and service jobs in more than 130 departments. The College has an inclusive Christian character, expressed in its motto, God has made of one blood all peoples of the Earth. Berea's primary service region is the Southern Appalachian region, but students come from all states in the U.S. and in a typical year, from more than 60 other countries representing a rich diversity of colors, cultures, and faiths. About one in three students represents an ethnic minority.